I thought I’d explain how the blog came to look like it does. 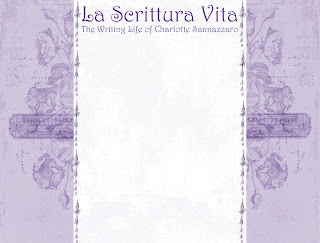 I’ll also give an indication of what I want the blog to be, in terms of tone and message. The first thing to decide on was the name. I didn’t just want to call it after me, and for a while I had no idea what to call it. Then as I was working on my WIP, trying to finish reading a book in my genre (this particular one being a chore), and also researching a forthcoming trip. My life was all about pages – the goals I was setting myself around how many I would read and write each hour or each day (or usually, before a given mealtime). So I thought about something to do with pages, like “Living in Pages”. That sounded a bit boring, so I thought what about “Breathing in Pages” or “Dreaming in Pages”. None of these were floating my boat. I was reading an article which was completed unrelated (I can’t even remember the subject now), and it mentioned “la dolce vita” (Italian for “the sweet life”). 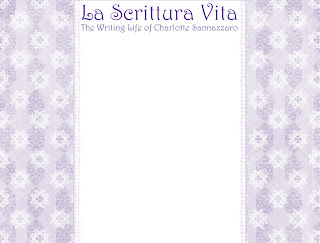 And for some reason it clicked in my brain, and I thought “I wonder what ‘The Writing Life’ in Italian would be”. 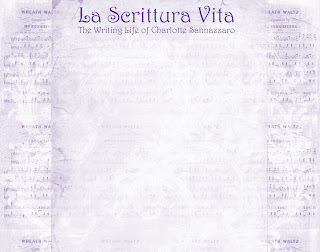 Then I looked it up, along with some of the other titles previously mentioned, and settled on La Scrittura Vita. Why Italian? I’ll explain my background another time, but suffice to say anything sounds more romantic in Italian. Don't ask me why I went with purple. It was arbitrary and felt right at the time. I decided I wanted to have a relevant image next to it, so I searched for free images of fountain pens or open books. Nothing was really working. There was a very nice stock image which I couldn't buy on its own and can't show here. I experimented with random paint brushes and effects in Photoshop, but wasn’t really happy with that either. I decided to look for some free stock headers to work from. I came across the Background Fairy and I really liked some of her stuff. But it was all a bit too old-fashioned in style for what I was going for. If I was still writing historical romance these would have been cool. But I want something fresh and modern, to go with what will hopefully be an optimistic and inspiring blog. It’s called “A New Day” and it works for me on several levels. First, my head is always in the clouds - whether I’m writing, planning my life or just dreaming up grand visions for the future. Then there is the light shining through the image. This represents new hope for me; a new direction. Since I turned thirty I am trying to focus on worrying less, pursuing my dreams more (especially literary), and generally enjoying the small pleasures of life. The birds in the trees represent my love of animals and nature, and the butterflies are a wonderful image for me of beauty, grace and joy. I started up a new blog using Blogger, and played around with the template designer. Because the image was so strongly blue I decided I needed to carry the theme through. Then I found the clouds which pretty much matched the header, and I was all set. Then once I’d done all this, I saw that Blogger has backgrounds which have books in them. I’d found what I’d been looking for all along, but now I didn’t want to use it because I had this other theme going on. And I quite like it. I hope you do too.